One of the largest impermeable surfaces in most home gardens is the roof. The roof of a 1500 square foot home has approximately 1500 sq. ft. of rain collecting surface. A good rainstorm – which drops ¾ of an inch of rain – provides almost 94 cubic feet of water falling on a 1500 sq. ft. roof. That’s about 700 gallons of free water running off your roof in a single storm. The easiest way to collect and direct water from your roof is by installing rain gutters. A rain gutter is a narrow channel or trough which collects and diverts rainwater shed by the roof. Rain gutters are connected to downspouts or rain chains which direct the water down to ground level. The water can then be collected or diverted to desired places in the garden. Rain gutters provide a number of benefits. They help reduce soil erosion and plant damage beneath the drip line and prevent leaks in basements and crawlspaces. They prevent water from running down the side of the house or splashing onto the house, causing damage to the walls and foundation. They also prevent soggy ground next to the house, which can be annoying and affect plant health. Gutters also allow you to use rainwater by directing it to a rain garden, vegetated swale, french drain or other place where it can infiltrate into the ground. In other words, gutters play a key role in harvesting rain and using it to water your garden. In Mother Nature’s Backyard, we divert our water into two places: our rain garden and french drain. All the water that falls on the garden stays in the garden. Gutters are part of a system for collecting water. In addition to the gutter and downspouts, the system includes a method of hanging the gutter, end caps and other components. 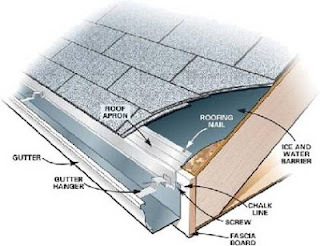 For a good discussion of the rain gutter components see: http://www.hometips.com/buying-guides/rain-gutters.html Once you understand the components and choices you’ll be better able to choose a system that’s right for your house and garden. You can install rain gutters yourself or have them installed professionally. Installing them yourself saves money and the components are readily available (see below). On the other hand, professional installers will get the job done quickly and may have more materials & colors to choose from. Installing gutters is not difficult if you have basic handy-person skills, but it is a little persnickety. If you have a two-story house, seriously consider having a professional install your gutters. Here are some common questions gardeners have about rain gutters. Do I have to install gutters all around my house? No. The choice is up to you. Some home owners just install gutters in areas where dripping rainwater is a particular problem – for example, over entry ways or places where the ground stays muddy. Others install gutters all around their house. You need to weigh the costs and benefits when deciding how much of your home to gutter. What types of rain gutters are available? Rain gutters are available in a range of styles and materials. Some of the most common materials used in S. California are PVC plastic, aluminum, stainless/galvanized steel and copper. Each choice has its benefits and drawbacks. Plastic gutters are light-weight, inexpensive, readily available and are the easiest material for the homeowner to install. They are more likely to break and/or leak in colder climates or sunny exposures, so they need replacement more often than metal gutters. Higher quality plastic gutters have UV inhibitors that extend their life, but plastic gutters just don’t last as long as aluminum. They may be the best choice, however, for homes within a mile or so of the ocean because they stand up to salt exposure. Steel gutters have the advantage of being stronger than either plastic or aluminum. That’s important in areas with snow and ice buildup, but less important in most areas of S. California. Galvanized steel gutters with an enamel coating are relatively inexpensive and are resistant to corrosion; but they will eventually rust through and need to be replaced. They come in a variety of colors, but must be ordered from the manufacturer or gutter installation companies. They also require soldering joints and are therefore usually professionally installed. Stainless steel gutters are more expensive and mostly used for commercial buildings in our area. Copper gutters are the most expensive – up to $20 a linear foot. They last a lifetime and add a beautiful touch to the home. They don’t require painting – once they’re up they will look good for a long time. They are usually installed as ‘seamless gutters’ and installed professionally. What are seamless gutters? Gutters available in home improvement stores are known as sectional gutters. The gutters come in 10 to 22 foot lengths and are connected with snap-on connectors to form longer lengths. They can be cut to form shorter lengths. Sectional gutters are easier to handle and don’t require special equipment. Seamless gutters are metal gutters that are formed custom-size from sheets of aluminum, steel or copper. The gutter-forming machines are portable, so the gutters are made on site. Seamless gutters are made and installed by professional gutter or roofing companies. What options are there in terms of gutter size and shape? Gutters come in several shapes and sizes. The most common shapes are shown below. If you choose seamless gutters, you may have fewer choices, since most portable gutter forming machines make only one design – usually the K-style (also called Ogee style). The K-style gutter is available in plastic or metal, sectional or seamless, and is probably the most common style for area homes. Rain gutters also come in several channel sizes, ranging from 4 inch to 6 inch for residential models. The most common is the 5 inch, which is what you’ll likely find at home improvement stores. If you have a very large roof, a tile roof – or live in an area with torrential downpours – you might want to consider a 6 inch channel width. What are rain chains? Why use them instead of downspouts? Rain chains are a traditional Japanese way to direct water from the gutter to the ground in a decorative way. Rain chains are typically either a series of metal cups, chained together with a hole in the bottom of each, or chain links that span vertically. They often are made of copper but can be made of other materials. 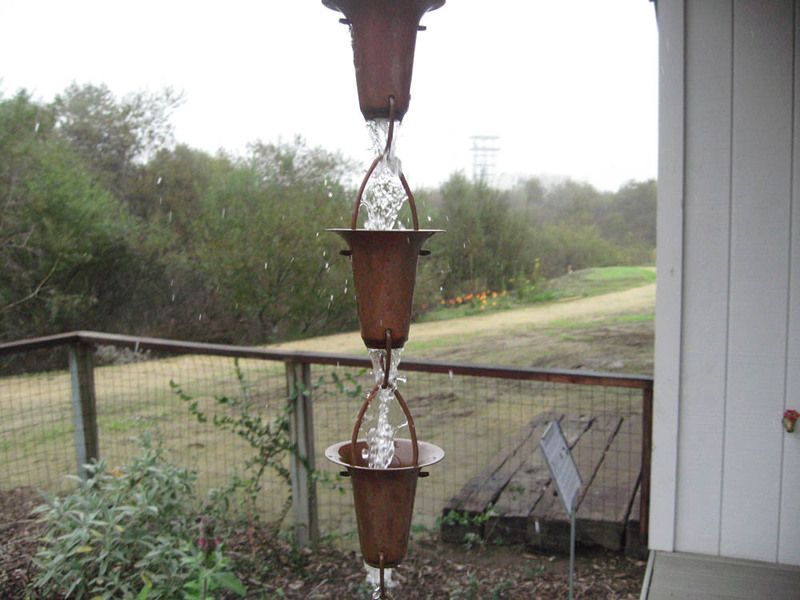 Our rain chain in Mother Nature’s Backyard is a simple copper cup design (see below). There are many attractive rain chain designs, with prices that range from less that $100 (U.S.) to more than $500 per chain. Rain chains are available from local roofing/gutter suppliers or can be ordered on-line. Choose a rain chain instead of a downspout if it works well with your home design. Rain chains are easy to install. They usually come with an adapter/hanger that fits inside the drop outlet (or you can just cut a hole in the gutter – see below). How do I maintain my rain gutters? Rain gutters do need routine maintenance. Equipping your rain gutters with gutter screens or louvers allows water to flow through, while keeping out some of the leaves and other roof debris. You may want to consider these accessories. Other gutter protection devices include strainers, snap-in metal and plastic gutter guards, filtered gutter guards, stainless steel gutter guards, hinged gutter guards and even gutter brushes that look like hairy caterpillars. Regardless of the gutter guard protection, all gutter systems should be examined for cleaning and repair twice a year. Leaves blow in and birds leave materials – or even build nests – in gutters over the summer. We suggest cleaning your gutters once just before the rainy season begins (October in our area) and once again mid-way through the rainy period (January in most areas of Southern California). There are a few tricks to cleaning your gutters ( see: http://www.youtube.com/watch?v=2_9WJSzV6fw). If there is significant damage or corrosion of your gutters, you’ll need to either replace the damaged sections (if you have sectional gutters) or replace your gutters altogether. How do I select a gutter contractor? Use only a licensed contractor with either a D-24 (Metal Products Contractor) or C-43 (Sheet metal Contractor) license. Be sure to ask the contractor for references; you may want to check with the Better Business Bureau and Angie’s List as well. The contractor should be able to provide samples for you to see the sizes, colors, materials and styles. S/he should be able to answer your questions in a professional manner, without pressuring you to buy. Get a firm price quote before work begins. We suggest comparing the quote to the costs provided by the following cost estimator: http://www.homewyse.com/costs/index.html#gutters If the quoted price seems out of line, try another contractor. California native plants make wonderful additions to the home garden. They add color and fragrance. They provide habitat for birds, insects and other creatures. And they can supply us with food. Beginning in late winter, California native plants provide a range of leafy greens that can be used raw or cooked. You might want to consider planting some for their food value alone. Growing your own food has lots to recommend it. It’s fun and good exercise for the whole family. You can pick foods at the ‘peak of freshness’ and control their growing conditions (for example, use of pesticides). And you can grow the foods you like – including heirloom varieties that are particularly flavorful. California native plants have flavors that are uniquely their own. Use them in cooking and your friends and family will marvel! California native plants produce a wide variety of edible products including fruits, seeds, edible roots and leafy greens. It’s extremely important to know which plants are edible – and which will make you sick or even worse. One advantage of growing native food plants is that you know you are using an edible plant rather than a toxic look-alike. It’s also important to know which parts are edible, when to pick and how to prepare them. That’s where Mother Nature’s California Gourmet series comes in. Our first postings covered picking and cooking with elderberries (August 2012). We’ll continue to discuss native edibles as food plants ripen in Mother Nature’s Backyard. Some of the earliest native spring greens are provided by plants usually thought of as annual wildflowers. 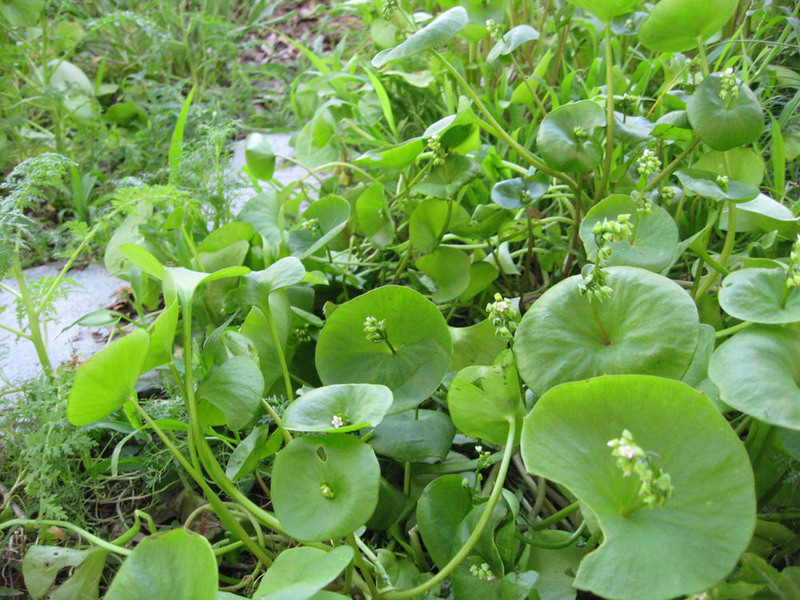 Our Plant of the Month (February 2013), Miner’s Lettuce, is one such plant. Many – but not all – of the spring annual greens have mild flavors. These include Miner’s Lettuce, the various Sun-cups (Camissonia species), Seep Monkeyflower and the native Clovers (Trifolium species). For a complete list of edible native greens plants see: http://www.slideshare.net/cvadheim/gourmet-greenslist. You might also want to read our January 2013 posting on ‘Growing Annual Wildflowers’. Annual greens should be harvested before the plant begins to flower. Many plants change dramatically when they reach the flowering stage, producing chemicals to deter insects and others from eating them. This often translates into bitter-tasting greens. So pick greens before flowering and wash them as you would any leafy green vegetable. Then use them raw in salads, sandwiches, tacos, etc. 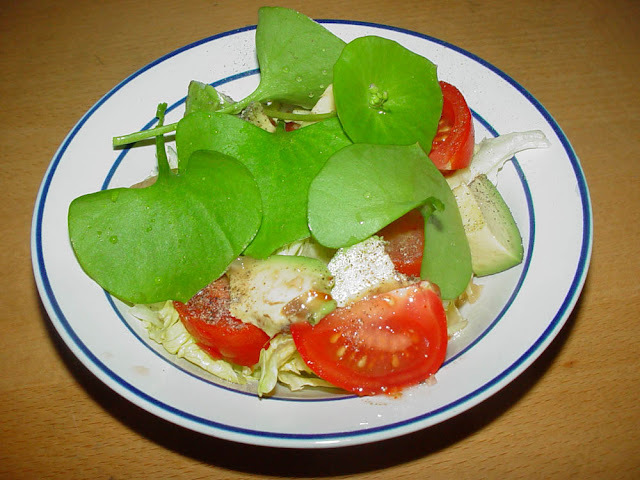 You can use the mild native greens in any recipe that calls for uncooked spinach or lettuce. Taste them before you use them. If they are too mild for your taste, pair them with more flavorful greens or seasonings. We’ll suggest some recipes next month (March 2013). Some native greens, particularly the later-blooming annuals (like Red Maids - Calandrinia ciliata) and the perennials are a bit more flavorful. 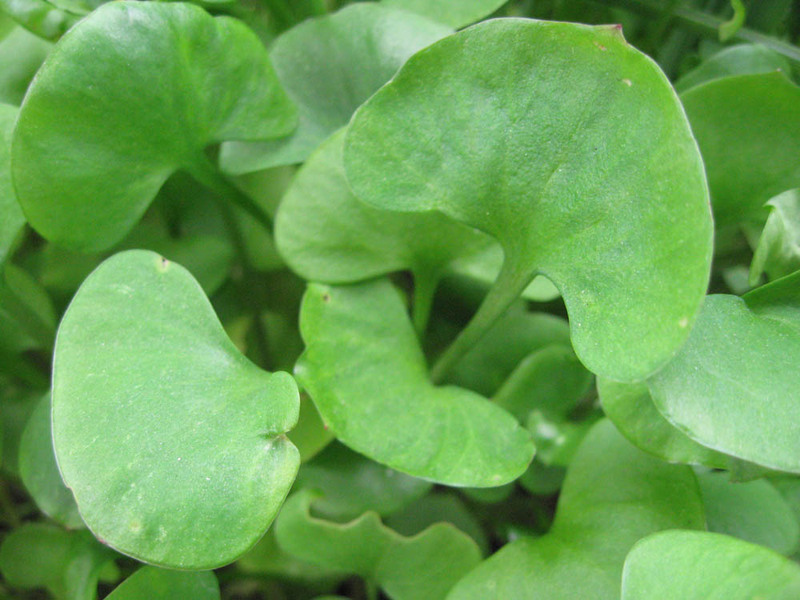 Many people describe them as piquant, in the same way that arugula is tart/sour/spicy. There’s a good reason why native greens like the Docks (Rumex species), native Oxalis, native Limonium, Heucheras (alum roots) and other leafy greens have strong flavors. Most produce oxalic acid – the same chemical that makes rhubarb taste like rhubarb. Some of the stonger-tasting native greens owe their unique flavor to another group of chemicals – the tannins. Plants that make these two types of chemicals taste better – and are better for you – if cooked before they are eaten. When using the stronger-flavored greens, taste a bit of the leaf before using. If it’s quite tart or bitter you may want to cook it in several changes of water before using in a recipe. This will do two things: 1) break down some the bitter chemicals (through cooking/heat) and 2) remove some of the water-soluble chemicals in the change of water. Once again, it’s important to pick young leaves and stems prior to flowering as levels of these chemicals are lower in the young greens. If the leaves are milder tasting you can just steam, sauté, microwave or bake the greens and use in recipes featuring cooked greens. If you have gout, rheumatoid arthritis or are prone to kidney stones you should take care to not consume much of the oxalic acid-containing greens (as well as cooked rhubarb and uncooked spinach, beet greens, chard and other foods high in oxalic acid). Oxalic acid breaks down during cooking, so it doesn’t cause a problem for many of us. But if you have gout, arthritis or have had kidney stones (or these conditions run in your family) heed this caution and limit your intake. It’s always prudent to eat a balanced diet and not eat too much of a single type of food. This is true for common garden fruits and vegetables as well as the natives. When trying a new food, start out by eating a small amount to see if it agrees with you. That’s just being sensible when eating something new. Frost-damaged foliage on white-colored Catalina Silverlace (Constancea [Eriophyllum] nevinii). Note drooping branch-tips and leaves, gray-brown color 1 month after frost event. Temperatures dipped into the mid-to-low 30’s F. several nights this winter, including one in February. Some of your sensitive plants may be showing signs of frost damage. The first sign is often drooping branch tips or leaves that don’t look quite right (see above). Our white-hairy native sub-shrubs were particularly affected in Mother Nature’s Backyard. Frosts are not regular events, but they do occur in our warm/temperate area. We’ll have a complete discussion of cold temperatures and frost next November (2014). You may be wondering whether to prune out the frost-affected areas now. Our advice is to wait and see. In our area, frosts are usually mild. This means that damage to plants may not be permanent. In the weeks after a frost, it’s often difficult to determine if damaged foliage will recover. That’s one reason to resist the temptation to prune out the affected area right away. If you wait a month or two you’ll be able to tell which areas are recovering (often re-sprouting by spring) and which are truly dead. You can then prune out the dead branches. Another reason to wait is to protect the new growth. Retain the damaged branches/foliage until the new growth beneath has a chance to establish – then prune out what needs to be removed. If a plant is completely killed by a frost, remove it in spring. Then consider whether to replace it with a more cold-hardy species – or replant in a more protected area of the garden. According to LA Stormwater (1), as much as 10 billion gallons of water run from dry/impermeable surfaces in Los Angeles County in a single rainstorm. That’s a whole lot of wasted water! And some of it is good free water you could have used to water your own garden. With global climate change, rising water prices and increasing water scarcity it’s time we all took harvesting rain seriously. The need is particularly critical for those of us who live in drier climates. In the next few months we’ll consider some practical steps you can take to insure that the water that falls on your property stays on your property. 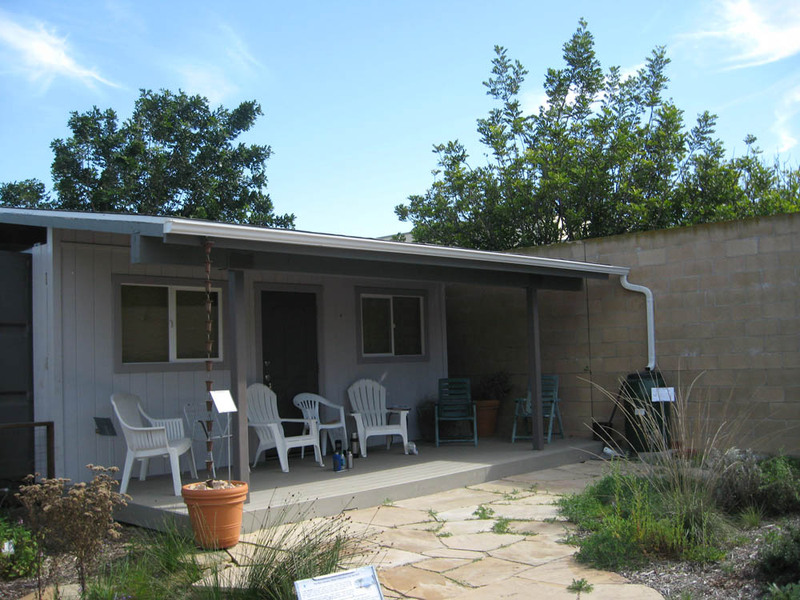 Later this month (January 2013) we’ll discuss the role of gutters, downspouts and rain chains in collecting water from your roof. In March, we’ll discuss rain gardens and vegetated swales, a great technique for infiltrating rainwater in home gardens. We’ll consider another good method to infiltrate rain water – french drains – in an April posting. Some gardeners like the idea of collecting/storing rainwater for use later in the season. We’ll discuss rain barrels and other storage options in May. And we’ll finish the series in June, with a consideration of permeable pavement. We hope you’ll want to follow this series and recommend it to your gardening friends. We’re still a little behind on rain this season. But the annual wildflowers are growing well and we look forward to a good show in a few months. Several edible annuals grow in Mother Nature’s Backyard. The Miner’s Lettuce should be ready for eating in a few weeks. Miner’s Lettuce (Claytonia perfoliata – pronounced klay-TOH-nee-uh per-foh-lee-AY-tuh) is sometimes still called by former names Limnia perfoliata and Montia perfoliata. The generic name Claytonia honors John Clayton (1686-1773), said to be the greatest American botanist of his day. The Claytonias present some taxanomic challenges, since there is much variability within species and the several species can hybridize (interbreed between species). Miner’s Lettuce is an annual wildflower in the Portulacaceae (Purslane Family). It is native to Western North America from Canada to Guatemala. Our local subspecies, ssp. mexicana and perfoliata, are common in moist or seasonally moist areas, often on shady or disturbed sites of less than 2000 m. (6500 ft) elevation. You can still see it growing wild in the Santa Monica Mountains, on the Palos Verdes peninsula and on the Southern Channel islands (Santa Catalina; San Clemente). Miner’s Lettuce is grown more for its foliage than its flowers. As its name suggests, Miner’s Lettuce is edible. In Europe, this plant is sold under the name ‘winter purslane’ as a winter/spring salad green. The leaves are bright green and succulent. The variability in leaf shape often surprises the first-time grower. The new leaves are almost linear (see final photo). Later leaves are either rhomboidal or wedge-shaped. Only the final leaves are the rounded, stem-clasping leaves that most people think of as ‘Miner’s Lettuce leaves’. 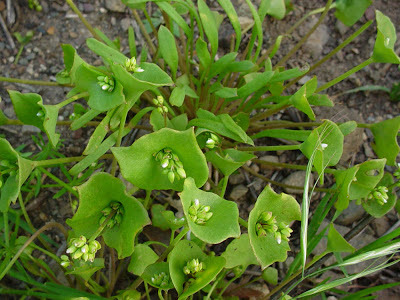 Miner’s Lettuce is best eaten before the plant begins flowering - the leaves become bitter tasting once flowering commences. Pick individual leaves, wash, and use as you would lettuce in salads, sandwiches, tacos, etc. They add a pretty color and texture to these dishes. You can also use Miner’s Lettuce leaves as cooked greens. They have a rather mild flavor, so you might want to pair them with more flavorful ingredients like mushrooms, chives, garlic, chili peppers or bacon. They are best steamed or sautéed. A few chopped leaves with help thicken a soup or stew. The flowers of Miner’s Lettuce are small and white or pale pink. They form on flowering stalks that extend beyond the mature leaves (see picture above). The flowers are sweet and old-fashioned – but so small that all but the very observant will miss them. Plants are self fertile and usually pollinated by fly pollinators. The plants flower anytime from March to May, depending on the weather, soil moisture and light. 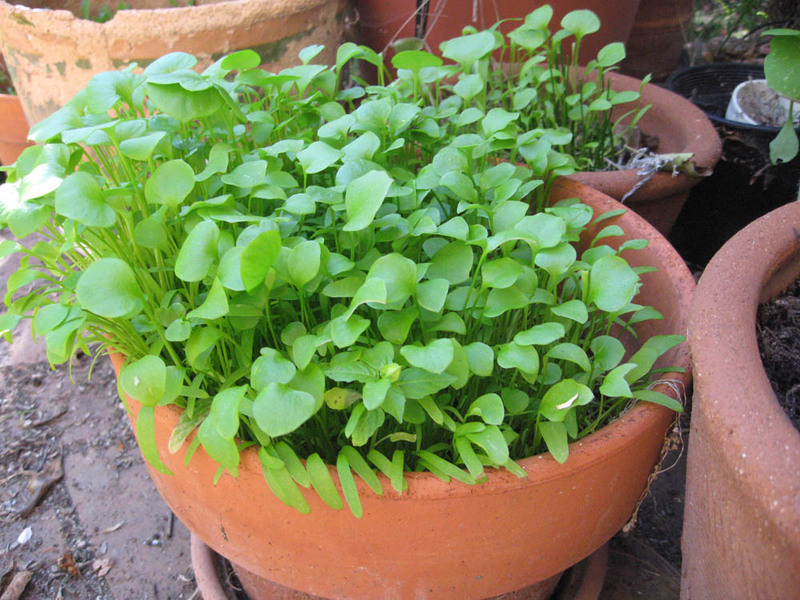 Miner’s Lettuce is an easy annual edible to grow. It’s a great plant for children to grow from seed. The plants produce many small shiny black seeds. In fact, Miner’s Lettuce will happy re-seed around the garden. Plant seeds as the fall/winter rains commence, either in the ground or in containers. Just barely cover the seed. You can use a thin (< 1 inch) gravel mulch if desired. Seedlings will emerge once the ground is sufficiently moist. The plants mature quickly, so keep an eye out if you want to eat them. Be sure to keep the soil moist during winter/spring dry spells; once the plants have flowered, cut back on the water to let the seeds develop. Grow Miner’s Lettuce in just about any local soil. They tolerate full sun to almost full shade – they are great under trees as a spring groundcover. Mix with other native annuals and grasses for a mixed meadow or prairie. Use as a winter crop in the vegetable garden. Or just let it re-seed in out-of-the-way places throughout the yard - it’s a great filler plant. Ground feeding birds like doves will gobble up the seeds, leaving just enough for next year’s crop.